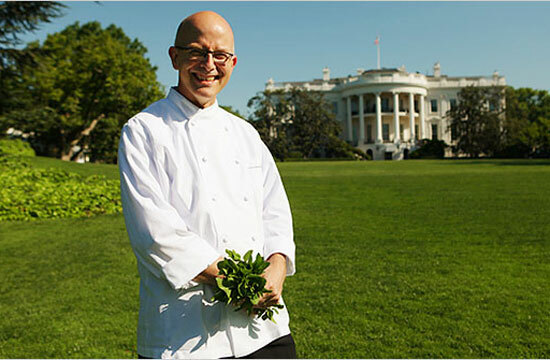 Everyone likes it when Bill Yosses, White House Executive Pastry Chef, molecular gastronomist and gingerbread manse builder, tells them things in a lecture format. (In fact, Yosses has done it at Harvard and at science conferences, prompting some to believe he is a Lizard-Man.) Hence, he’ll be headlining a conference — specifically, a TEDx Conference — in New York City on February 16th, focusing on the successes and challenges of First Lady Michelle Obama’s Let’s Move! initiative. Titled “Changing The Way We Eat,” the conference will focus specifically on anti-obesity measures, farming, and the general state of food in America — a topic that Yosses is well qualified to speak about as one of the advisors on Let’s Move!, which, coincidentally, hits its third anniversary around that time. Other participants, according to Obama Foodorama, include chefs Ann Cooper and Peter Hoffman, and Stonyfield Farm chairman Gary Hirshberg. Tickets to the event cost $135 and potential audience members must fill out an Application For Smart, Erudite People in order to attend. Of course, this being a TEDx talk, the conference will also be streamed online for those deemed unworthy to see Yosses’s glistening dome head in person.